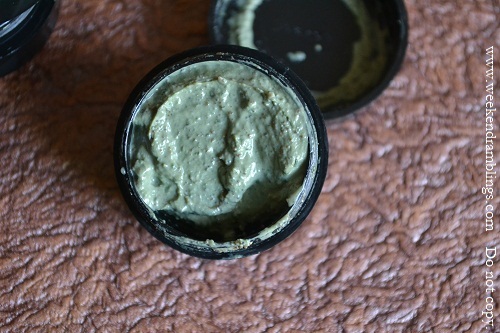 Lush Love Lettuce Fresh Face Mask - Balancing face mask for normal to oily skin. A mask with fuller's earth and kaolin, which are clays to dig deep and extract dirt. Then you have ground almonds and almond shells which you massage in to exfoliate away old skin cells and smooth your skin. On the giving side you have a decoction of agar agar seaweed with lots of lovely minerals to be absorbed into your skin, plus moisturising almond oil and balancing lavender to control oils. All fair in love and lettuce. 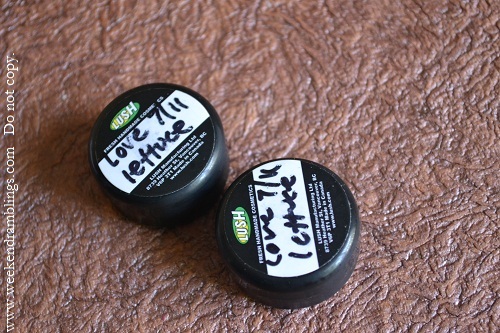 I got samples of Lush's Love Lettuce fresh face mask when I bought the Jungle solid conditioner. The samples are enough for at least 4-5 uses. Fresh face masks are made with all natural ingredients and hardly any preservatives - they are kind of look thick smoothies - and have to be kept in the fridge and used up within about a month. 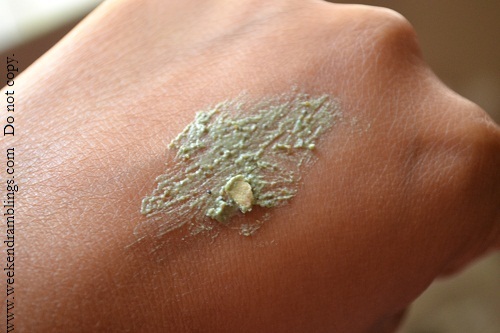 This is a green-coloured mask with a granular texture to it from ground almond shells. The smell is quite pleasant and relaxing and not too strongly perfumed. The mask is quite easy to spread as long as you don't try to make a really thin layer - it isn't smooth, is a bit granular, and there are also some unidentified larger white particles in them which will just end up falling off the face. How To Use: Leave the mask on for about 10-15 minutes to dry, and you can feel it tightening on the skin. While washing off the mask, what I do is, wet my hands a bit and scrub the mask a bit and then wash it off. Results: It is a scrub-mask meant for oily-combination skin. The scrubbing effect is quite mild but perfect to be used at least twice a week. The firming effect from the mask as it dries also feels quite nice. It does leave a bit of an oily residue after washing it off, so I wouldn't recommend it to oily-skin girls or if you have some acne-prone day. Ingredients: Agar Agar Gel (Gelidium cartilagineum), Kaolin, Honey, Fullers Earth, Glycerine, Almond Oil (Prunus dulcis), Ground Almond Shells (Prunus dulcis), Ground Almonds (Prunus dulcis), Lavender Oil (Lavandula angustifolia), Chlorophyllin (CI 75810), Geraniol, Limonene, Linalool, Perfume. Not my favorite mask from Lush, but if you are looking for a basic scrub-mask that would give a gentle scrub, a bit of firmness to the skin, while still nourishing it and not drying it out, then this would be your perfect pick.